Extinction Time Line and Time Warps: do we have to wait a new beginning? 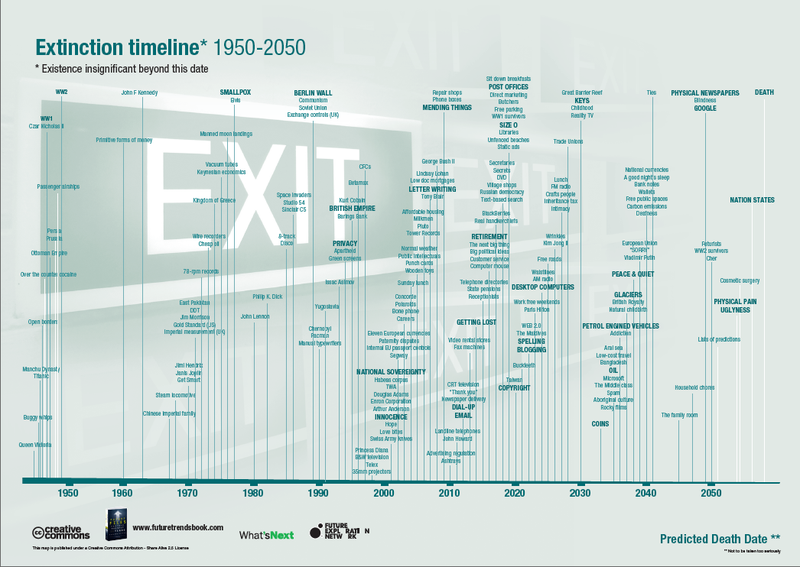 According to the famous “extinction timeline“, here, we bet on some disappearing periods, and prepare sometimes to live just like if we were projected “on the other side”, through a time warp. Does it hurt? Sometimes yes, sometimes not, while there’s simply some hard fences that oblige us to renew lots of things in our lives. Considering some pictured events and stuffs, some evidences area already there: facing threat of emptiness, humanity is then forced to innovate, to “survive” or adapt to new style/way of life. Thinking now of living without TV or web, is probably real, accepted from few, but is meaningless for the bulk. And rise of such new ways of information or entertainment has been made with fall of other previous modes. Thinking about all these vanished empires, technologies, and seeing the rythm gearing up’, why couldn’t it exist another parallel world, where, like black holes, born lots of derivate ways of doing progress. Trust we must, trust we doubt, but meanwhile, it seems that things that disappear, may be recreated in others mass of pure creation, kind of “loud and pure essence of brain work”. That is to say, “nothing is lost, but everything has to being transformed”: like gas into water after cooling, or water into gas before in warming it. And these transformation may not be visible for us, in upper level dimensions, starting with fourth, time, and lots of after, leading us to such questions like: if I can’t see it or be a witness, is it that it’s not true, real, or is it that it overtake our imagination and concrete mind? I always want to believe in the “unbelievable”, because, like innovation in companies, try and search drive us to unchain the creation power and nothing can’t prove us, as we can believe in other dimensions and what science still ignores. We still need some “endless searchers” to be pioneers toward new worlds and new trends. Should we imagine that, because a new disruptive model comes, old methods disappear? not necessary and not automatic I guess, while old can be transformed, switched or merged, on the influence of other dimensions. In a way, something we can’t explain with traditional words, sentences, demonstrations or mathematics. But that’s not why we can’t that it doesn’t exist. Belief is the first step to explore time holes and other black parts of the universe. Why couldn’t it be there, why so much strange things in devil’s triangle? unexplained.